Continued from Stage 11 - page 1. The mountain range between Villafranca and San Juan de Ortega is a nature reserve full of oak, juniper, ash and pine trees. On your journey you may be lucky enough to catch a glimpse some of the abundant wildlife such as foxes, otters and deer. 2 kilometres out of Villafranca you come across the Fuente de Mojapán, literally translated as the fountain of moist bread. 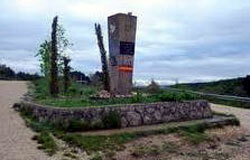 Continuing along the tree lined path and at around 1163 metres above sea level you come across the Monumento de los Caidos, a memorial to the victims of the Spanish Civil war, one of many such monuments throughout Spain. 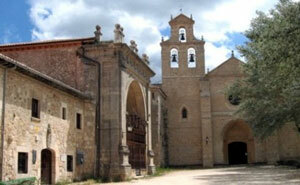 The next stop on your journey, San Juan de Ortega, is approximately 7 kilometres from this point. From here the path starts to descend towards the Rio Peroja, once across the river the track begins to climb once again. From here on in the path is pretty straight passing through pine woods known as the Alto de la Pedraja, and through fields of heather. The track finally starts to descend and the countryside laid out before you is a complete change from what you have just experienced and feels as if it is straight out of a beautiful landscape painting. The path continues to descend crossing a footbridge across a stream and passing the 12th century Ermita de la Valdefuentes, the only remaining part of a gothic pilgrim hospital. After a small climb the path once again descends as you enter the small hamlet of San Juan de Ortega. 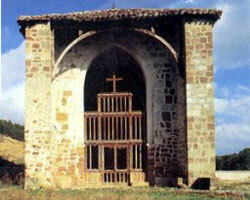 San Juan de Ortega was, like his mentor San Domingo, an architect and prolific builder. He was involved in building a number of bridges, hospices and churches, all dedicated to helping the Peregrino, or pilgrim, on their journey through the region. The recently restored church and monastery dedicated to San Nicolás de Bari was built by San Juan following a near fatal shipwreck. San Juan was returning from a pilgrimage to Jerusalem when his boat was shipwrecked in a storm. The saint prayed to San Nicolás de Bari for salvation. He was spared and returned to the Montes de Oca, then a wilderness and prone to bandit attacks, where he built a hospice in honour of the saint that had saved his life. San Juan also founded a monastic order and built the 12th century Iglesia de San Juan de Ortega where you can find San Juan's Romanesque sarcophagus. The sarcophagus had originally been in the crypt but following a flood in 2005 this was moved to the church. San Juan has built a reputation of being the patron saint of fertility. The legend refers to an incident when the tomb of the saint was opened and a swarm of white bees escaped from the tomb surrounded by a wonderful smell. The bees were believed to be the souls of unborn children being kept safe by San Juan until a suitable Christian woman could be found to bear that child. Queen Isabela la Católica visited the church in 1477 after having being childless for a number of years. She went on to have 3 children, the first, a boy she named Juan and the second, a girl she named Juana. The Queen ordered the rebuilding of the chapel as it had fallen into disrepair and commissioned the canopy placed over the saint's tomb. The church also contains an architectural masterpiece called the Milagro de la Luz, or the miracle of the light. When San Juan built the church he included a capital of the annunciation. From around 5pm to 7pm on the day of the spring and autumn equinox, subject to there being sun, a ray of light enters through the window and illuminates the Virgin of the Annunciation. If you wish to stay here, there is an albergue called Albergue del Monasterio and a café where you can get something to eat.